Anyway, as soon as it arrived in the post, I gave the Wobbler a quick wash and filled it with a selection of small-ish dog treats. I then put in on the floor in front of Molly and waited. And waited. It’s lucky I didn’t have anything too pressing to do, because what happened next kept me entertained for nearly an hour. First, she tried to stare it down and gave it a bit of a growl. No dice. The Wobbler stood its ground. 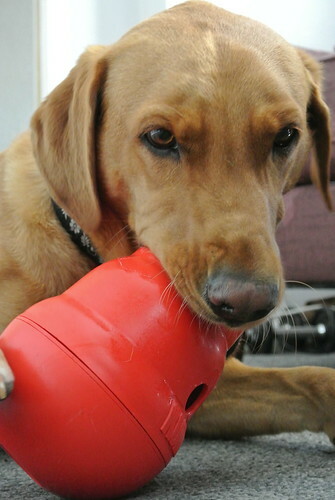 Molly was a little surprised that the Wobbler kept rolling upright, sometimes giving her a gentle tap on the snout, so she gave it a bigger shove. At this point, a treat fell out, which she hoovered up. The game was now clearly on. 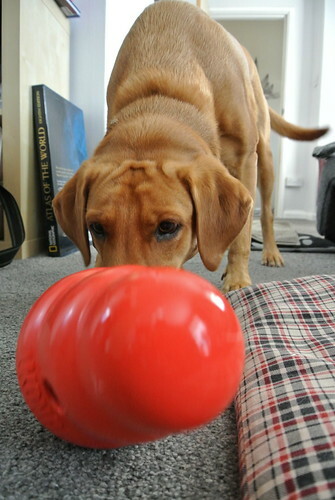 Having possibly decided to adopt a more forceful approach (Labradors are not renowned for their finesse), she then picked up the Wobbler and hurled it to the ground. When this elicited a treat, she picked it up again and hurled it against the living room wall. (I mentioned the lack of finesse thing, right?) This didn’t yield a treat, luckily, otherwise I dread to think how things could have escalated. 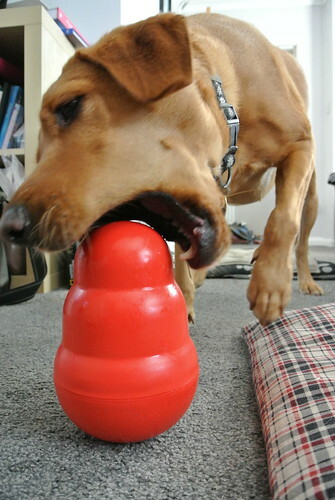 The next fifteen minutes or so passed with Molly wrestling with the Wobbler on the floor. 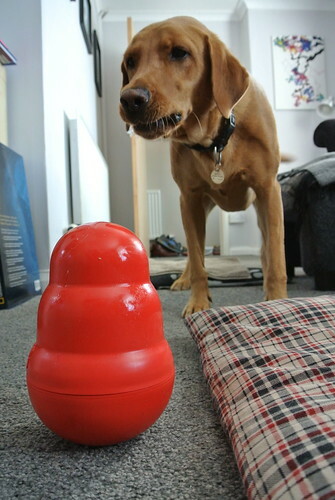 She managed to get a steady stream of treats, which kept her interested (and me entertained). She got a little distracted when our neighbour pulled up in his van, but clearly the distraction was not sufficient to entice her away from the task in hand. Periodically, the Wobbler would manage to get away from her and ensconce itself somewhere safely out of reach. 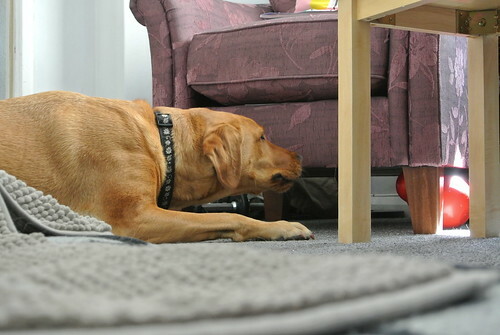 When this happened, Molly adopted her usual tactic of woofing loudly and waiting for human assistance. Better than trying to dig her way in, I suppose. So I’m massively impressed with the Wobbler. 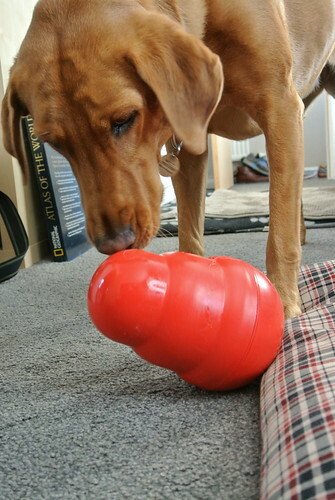 It kept Molly entertained for ages and has since proven to be a great way of giving the dog her evening meal, too. Rather than wolfing down the bowl of kibble in a matter of microseconds, she eats it piece by piece over the course of about half and hour. Frustrating for her, but probably quite good for her digestion. And much more fun for the rest of us, too. * Weebles wobble, but they don’t fall down! 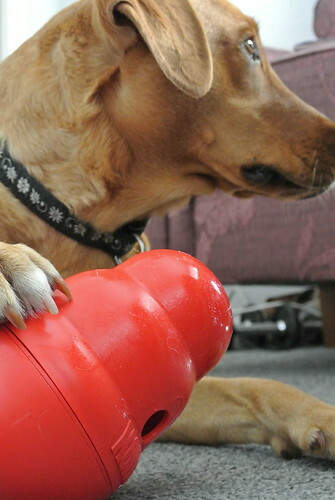 This entry was posted in Dogs, Photography and tagged Dogs, Kong, Molly by Simon Perks. Bookmark the permalink.